Bored using the same old CAGED chords? 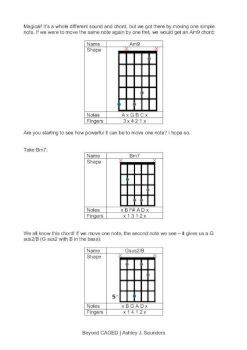 Want to expand your guitar chord knowledge? Then Beyond CAGED eBook is for you. We will explore the world of chords that aren't featured in the system as well as how to discover new advanced guitar chords for yourself. It won't surprise you to learn that there is a load of chords that aren't included in the CAGED system. So if you know and use the system but want to break free, then Beyond CAGED eBook is for you! As this ebook follows on from The CAGED System ebook, you will be inspired by new ideas and chords you can use straight away. 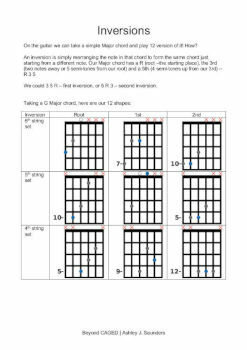 From chords using open strings, to close voicings, inversions and so much more. There are a world of chords out there that are not in the CAGED system and if you don't know them, you're missing out! In addition to exploring some interesting chord voicings, I'll help you learn how to discover new advanced guitar chords for yourself. 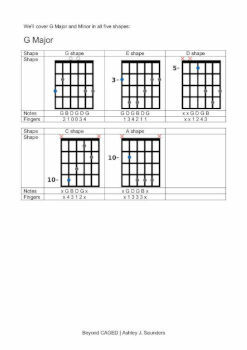 So if you're looking to take your knowledge of guitar chords to the next level, then this is the eBook for you! 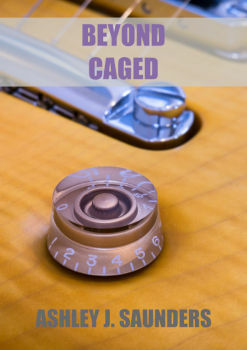 Discover how to break free of CAGED chords! If you're bored of the CAGED system and want to discover a whole load of new chords, then this eBook is aimed at you!